Over the past few decades, greenhouse gasses have been identified as the main cause or driver of Climate Change. Early research of gaseous pollutants indicated that Carbon Dioxide was the primary driver for warming the earth's climate. In recent scientific studies, however, other drivers have been identified - they too, are severely impacting our regional and global climate. One of these is Black Carbon. This latest research shows that Black Carbon is second only to carbon dioxide as a major contributor to Climate Change. It is having a significant effect within our Cryosphere – i.e. any areas on the planet with glaciers, ice and snow - including the North and South Polar regions. An electron microscope image of black carbon - it is much smaller than the diameter of a human hair. Following combustion or the burning process, these tiny, sooty particles are ejected into the air. They can remain in the atmosphere for periods of up to four weeks. Many of these tiny particles are carried by the prevailing winds over huge distances, before they are flushed from the air by rain or snow. Whilst tiny in size, they absorb enough sunlight to transfer this heat energy to the surrounding environment. This computer-generated image shows how sunlight reflects back into the atmosphere from pristine [unpolluted] icy surfaces. In an unpolluted environment, much of the sunlight shining onto the snow and ice is reflected back into the atmosphere. This explains why it is so easy to become sunburnt on the ski-fields. Not only are you subjected to primary solar radiation, but additionally to the secondary sunbeams reflected from the snow - this explains the need for strong glare goggles or sunglasses whilst skiing. This computer-generated image shows how sunlight is absorbed by soot-covered icy surfaces - no sunlight is reflected. "Soot is normally something you think of at the bottom of your chimney, but it also gets into the air, and scientists have been finding it at the frozen Arctic." "Soot gets into the air when fuel, vegetation and firewood are burned. When you watch the smoke and soot drift away from your chimney, you normally wouldn't think that it would drift to the North Pole and change the ice and snow there." It only requires 10 parts per billion of soot to hasten the melting process. Pollution at this microscopic level, whilst undetectable to the naked eye, is having a hugely disproportionate effect on our snowfields, glaciers and Polar Regions. 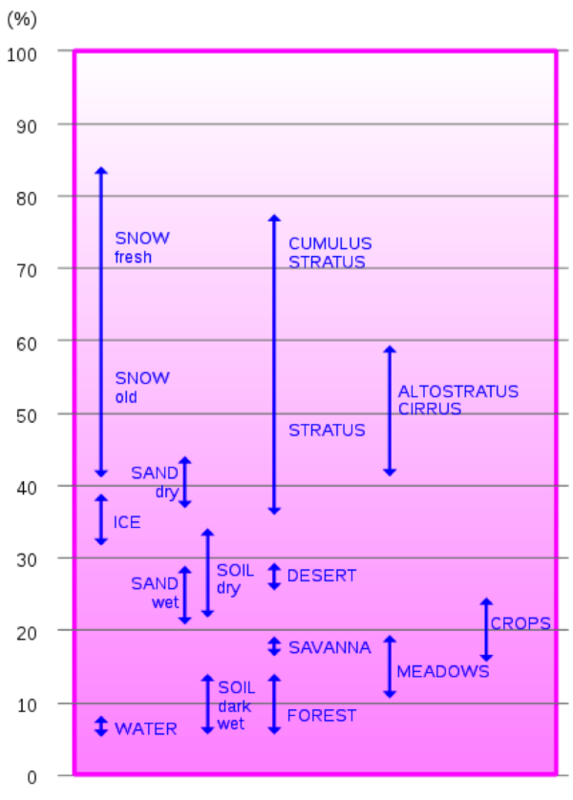 A graph comparing Albedo Indices of different materials - note the index differences between 'fresh' and 'old' snow. Older snow melts faster. Substances that are able to reflect more sunlight, have higher Index levels, whereas those with lower levels, absorb more sunlight and therefore increase - or force - snow and ice melts. This is yet another reason to prevent wildfires - because soot and ashes from burning forests and grasslands is melting our cryosphere.